This is one of the most important things to consider in the design of your wedding stationery. The card stock you choose to have your design printed on has a massive impact on how your stationery comes across so it's important to get it right. From vintage, festival themed to elegant and timeless, card stocks have been carefully selected to make the most of each different design. A whistle stop tour of 'gsm': gsm, or 'grams per square metre', refers to the thickness & density of a paper irrespective of its size. For our purposes, the higher the gsm, the thicker it feels. To give you a point of reference, most standard printer paper is 80 gsm. I use only professional grade card stocks with a minimum of 280 gsm. All card stocks are of the very highest quality from an FSC certified print firm. Nodo: 280 gsm. 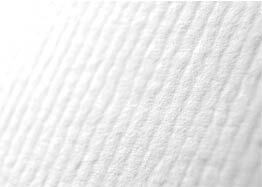 A crisp, refined paper with tightly condensed lines for a tactile feel. For the right product this is my personal favourite. Kolar: 300 gsm. Naturally lightly flecked brown kraft paper. Great for a vintage look, this paper has a higher absorbency than the others and so colours appear more muted. Genova: 300 gsm. Italian hammered textured paper perfect for a more lavish affair. Santa Fe: 350 gsm. A great all-rounder with a low sheen silk glow and the brightest, sassiest colour reflection. Santa Fe is soft and smooth to the touch. Magnetic: Available for save the date products only. Supple, light-weight (no extra postage costs!) and ideal for sticking to fridges etc to ensure that your date stays at the forefront of your guests' minds! Envelopes: Products requiring envelopes are supplied with correctly sized Kolar brown flecked envelopes, unless otherwise requested. Save the Dates, Invitations, RSVPs* and Thank You cards** all come with correctly sized envelopes as standard.